Multiple amp models: Clean, crunch, overdrive, whatever you need — in one hardware amp. 11 digital effects: Multiple effects, and even tap tempo for modulation/delay time. Included effects: wah, chorus, compressor, delay, reverb, phaser, and combinations. Multiple inputs: Guitar in, yes, but also an aux in (for an MP3 player, computer, etc.) and even a mic in. Portable, powered: Runs on an AC adapter or six C batteries, and weighs under 8 pounds. How, you ask? The speaker is a tiny 6.5″. Line, headphone outs: Plug in headphones and you defeat the speaker. Yep, this works well as a practice amp. There you have it: you can leave your laptop or heavy amps at home and practice anywhere you like. 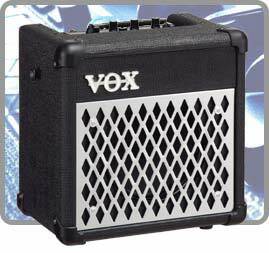 Don’t expect any big sound out of the speaker, but having different amp models and effects could make practicing more fun. Street price: US$140. Better add that to our Holiday Shopping List! And what’s more hilarious than using an amp as a stocking stuffer?